With a long Winter behind us and the warm, sunny weather just beginning to emerge, it may seem a little premature to think ahead to Christmas. 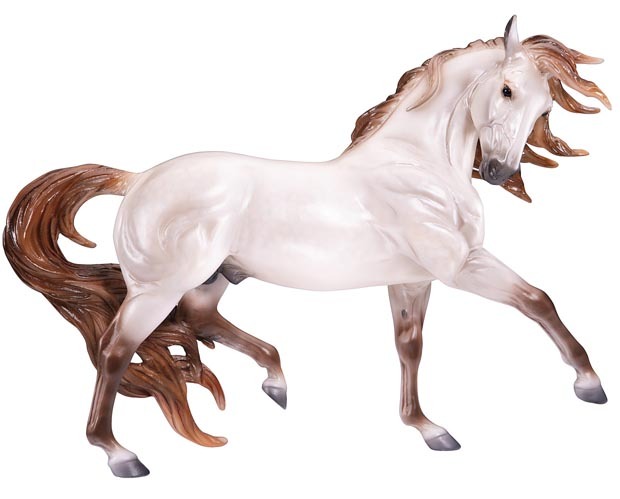 But for Breyer fans, the announcement of the Traditional Series Holiday Horse is an exciting event. We only receive these coveted items in limited numbers, so they tend to move fast once they hit our shelves in early fall. This past holiday season, I had to turn away more than one desperate customer searching for the 2013 horse in November and December. 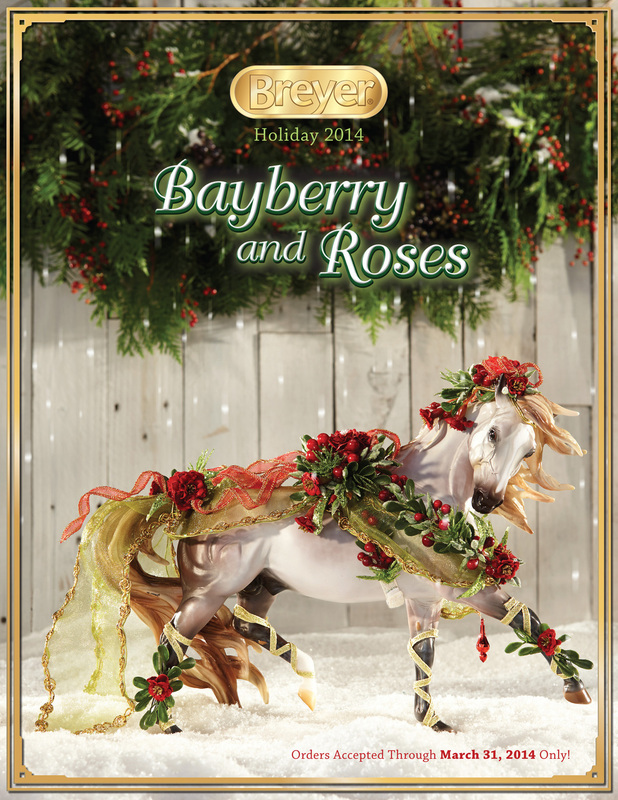 The festive stallion pictured here is Bayberry and Roses, the 18th traditional-scale (1:9) model in the annual holiday series. For those in the know, he is based on the Esprit mold, which was created by Kathleen Moody and introduced at the 2010 World Equestrian Games, where Breyer was named the Official Model Horse Maker. This mold definitely has something celebratory about it. 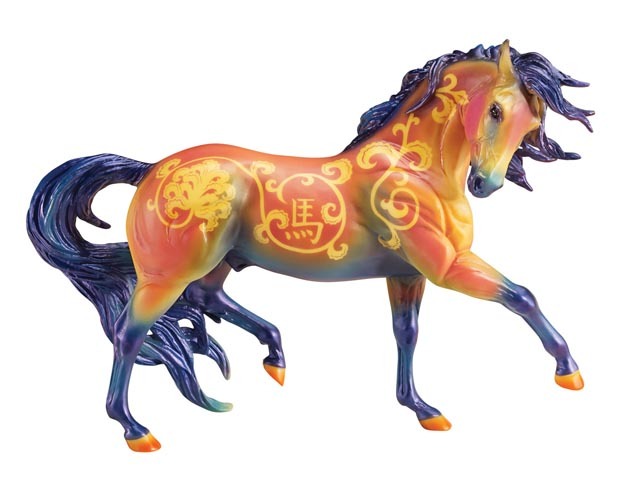 It has been used for both the 2012 Chinese Year of the Dragon and this year's Year of the Horse models--the latter of which arrived in our stores only in the past few weeks It is also the mold used for the current Lusitano model, which we also carry. Bayberry and roses is hand-painted a sleek shaded grey, his bold strut enhanced by his luxurious windswept mane and tail. His merry green, red, and gold tack is adorned with wreaths of Winter berries and flowers, making him look as though he has stepped right from the pages of a Christmastime storybook. Any Breyer enthusiast would be thrilled to include him in her collection, and he would make a stunning addition to anyone's holiday decor. Please feel free to come into one of our stores and speak to one of our associates about how to get your hands on Beyberry and Roses in time for the holidays.